It might sound like a bit of a fairy tale that a landlocked nation with a population of just 8.5 million people wedged amid seven other countries was once the heart of an empire so grand that “the sun never set.” It’s been almost a century since the Habsburg’s 640 year rule ended, but remnants of Austria’s multicultural empire linger on and can be readily identified as a heritage that distinguishes Austria from its German-speaking neighbors of Germany and Switzerland. One of the most obvious indicators of Austria’s royal past is the collection of palaces in Vienna. The Imperial Palace in Vienna’s first district, the emperor’s summer palace at Schönbrunn, and the two palaces of the Belvedere (the Upper and Lower Palace) serve as just a few of the reminders. Like most royal families, in addition to palaces, the Habsburg liked to collect other treasures. The most impressive of these items can be viewed at the Imperial Treasury of Vienna (Schatzkammer). Besides crown jewels, royal robes, and holy lances, you’ll find vestments of the Golden Fleece. 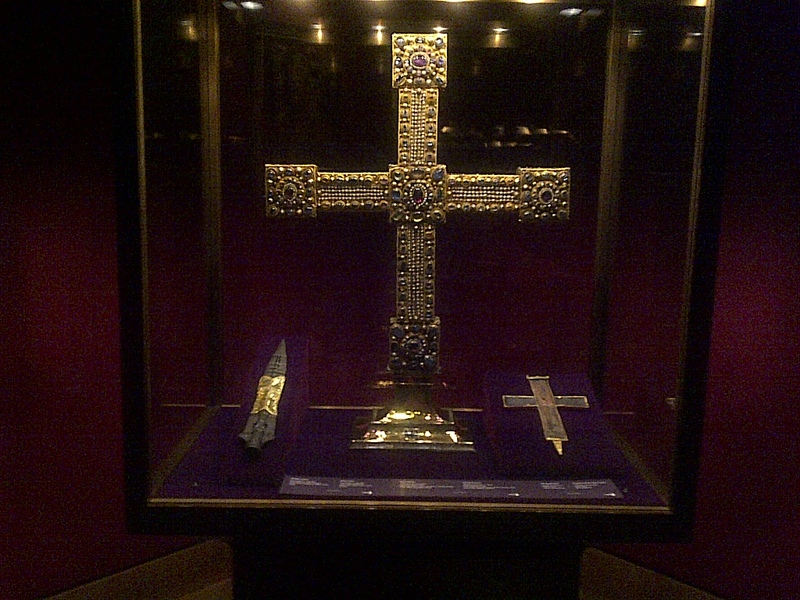 Particularly interesting are Habsburg heirlooms, which were often acquired by knights during the Crusades. Although the unicorn horn displayed might make you wonder if the knights didn’t get a little carried away in their bounty claims. (Franz: If we return empty-handed, the emperor is bound to say no to our next crusade bid and I couldn’t stand another winter of the Missus nagging for me to fix the well. Hans: Fine, then let’s give him this (picks up a stone). We’ll tell him it’s a unicorn horn. I wager that none of his lordship’s relatives in Germany or England can boast a unicorn horn). Ahh, the old “it’s a unicorn horn” trick. But who amongst us can truly deny the romantic mysticism, ala Dan Brown and Indiana Jones, when up close and personal with age old legends like the Spear of Destiny, and the Holy Grail. And what good is a fancy royal robe and magic sword without a beautiful white horse to show them off on? The Spanish Riding School still shows perfect performances of white Lipizzaner horses selectively bred for centuries. An interesting historical note about these gorgeous creatures is that at the end of WWII, famous American cowboy and soldier, General Patton, rescued them from what may have very well been an abrupt end on Marshal Konev’s dinner table washed down with a shot of vodka. Wonder the lanes of the first district, and you are bound to easily find hundreds more.